CLEVELAND — New coach. More focus. Less internal discord. 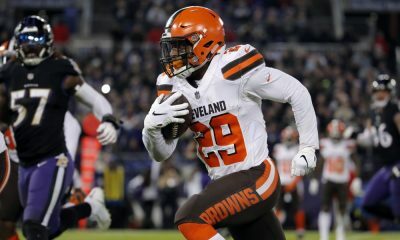 The Browns’ revised formula for the second half of the season led to a more cohesive effort and an entertaining afternoon as they tried to keep up with the dynamic and immensely talented Kansas City Chiefs. 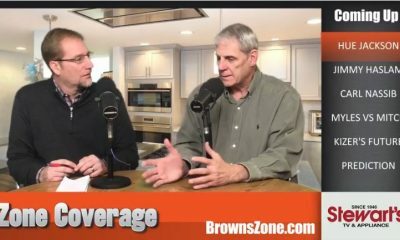 But postgame talk of progress was joined by the reality of a losing streak that reached four games with a 37-21 loss Sunday afternoon at sun-splashed FirstEnergy Stadium. 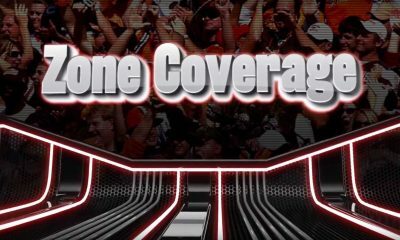 The chaos of the week — coach Hue Jackson and offensive coordinator Todd Haley were fired Monday and defensive coordinator Gregg Williams named interim coach — gave way to the precision and explosions of the Chiefs offense. 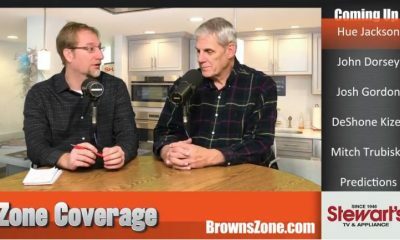 The Browns (2-6-1) needed to play nearly a perfect game to pull the upset, and that was before some of their best defenders were knocked from the game with injuries. 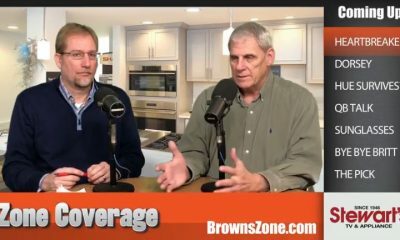 The Browns probably wouldn’t have stopped the Chiefs (8-1) with a healthy defense. They had no chance with their best players dropping like flies. 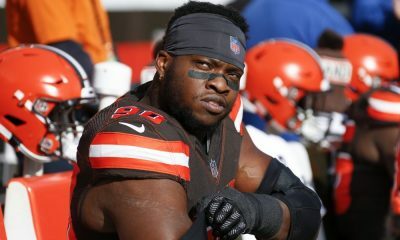 The Browns started the game without middle linebacker Joe Schobert (hamstring) and free safety Damarious Randall (groin). Then cornerbacks Denzel Ward (hip) and E.J. Gaines (concussion) and linebacker Christian Kirksey (hamstring) exited in the first half. 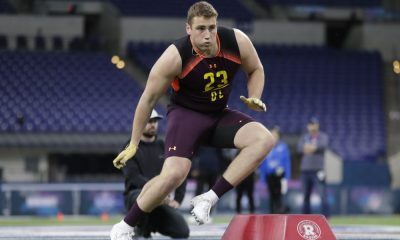 The defense finished with such unrecognizable names as linebacker Tanner Vallejo and cornerback Tavierre Thomas lined up against Chiefs stars Patrick Mahomes, Kareem Hunt, Travis Kelce and Tyreek Hill. 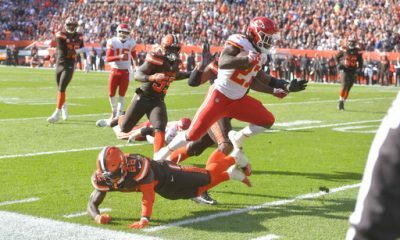 No wonder the Chiefs didn’t punt until the fourth quarter, scored five touchdowns in their first six drives — the exception was a possession started with 26 seconds left in the second quarter — and totaled 499 yards for an average of 8.6 per play. 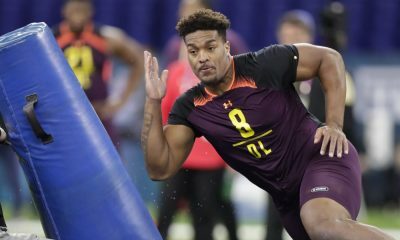 “A little different not having the best starters but you’ve got to do the best with what you’ve got,” said defensive end Myles Garrett, who had a sack and two quarterback hits. 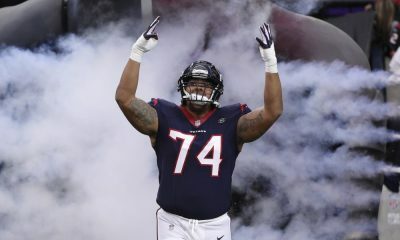 Williams was forced to play a ton of two-deep zone that only delayed the inevitable touchdowns by the Chiefs, who entered as the NFL’s highest-scoring team with 36.3 points a game. 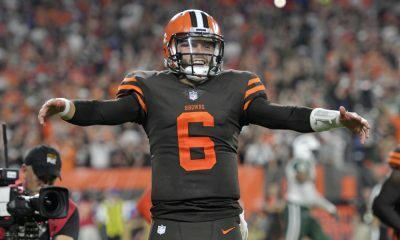 The Browns needed more than one takeaway (an end-of-half desperation heave from Mahomes) and to force the Chiefs into more difficult situations. The Chiefs went 6-for-10 on the limited occasions when they needed a third down. 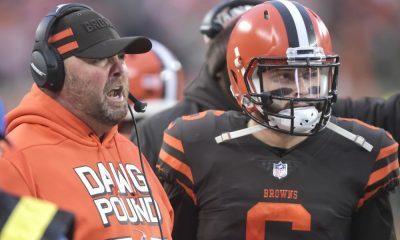 Williams and new offensive coordinator Freddie Kitchens had the right idea with a game plan of controlled aggression. 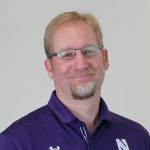 They tried to hang onto the ball — it worked in the first half for 18:31 in time of possession as they trailed 21-15 — with a commitment to the run game and going for it on fourth-and-shorts. 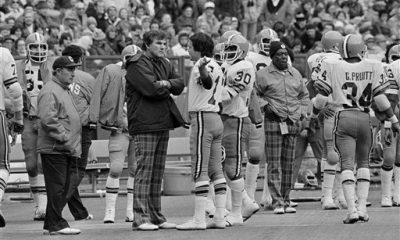 They also went for three 2-point conversions. The Browns were 2-for-3 on fourth down and 0-for-3 on 2-point tries. 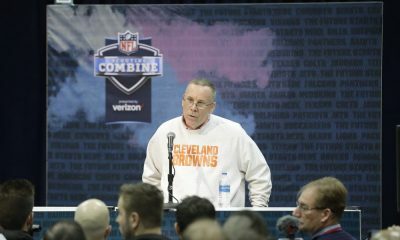 Columnist Jim Ingraham on Williams’ debut and the overdue ouster of Hue Jackson. “Love it. Love it. 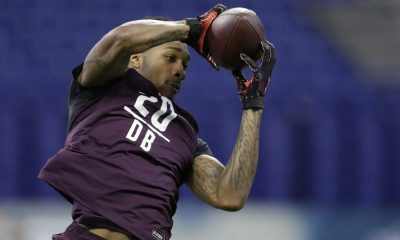 Love it,” said receiver Rashard Higgins, who returned from a three-game absence with a knee injury to catch three passes for 19 yards. Quarterback Baker Mayfield lost the personal matchup with Mahomes but thought he made a “big jump” from the previous few games. 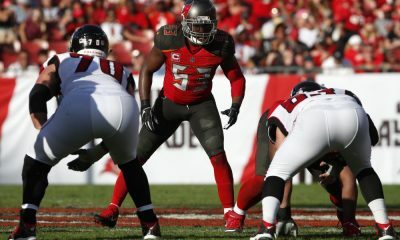 He went 29-for-42 (69 percent) for 297 yards, two touchdowns, an interception, two sacks and a 95.0 rating. 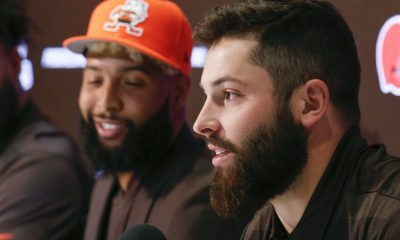 Mayfield says he took “big jump” against Chiefs. 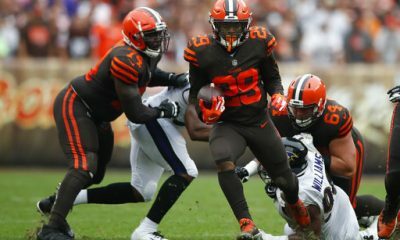 Running back Duke Johnson came out of moth balls to catch nine passes for 78 yards and two touchdowns, receiver Jarvis Landry had six catches for 50 yards and rookie running back Nick Chubb rushed 22 times for 85 hard-earned yards and a touchdown. 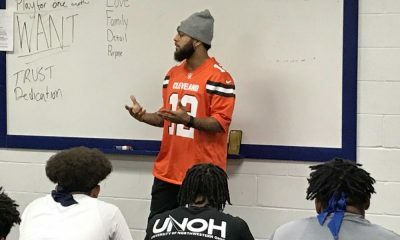 The uphill battle proved too much against a Kansas City offense loaded with playmakers, two of whom had extra motivation in their return to Northeast Ohio. Mahomes strengthened his MVP credentials by going 23-for-32 for 375 yards, three touchdowns, an interception, two sacks and a 129.0 rating. 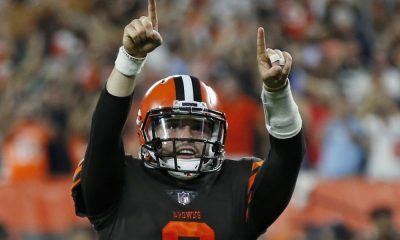 He has eight straight 300-yard games, and his 29 touchdown passes and 3,185 passing yards are the most by a quarterback in his first 10 career games since 1950. 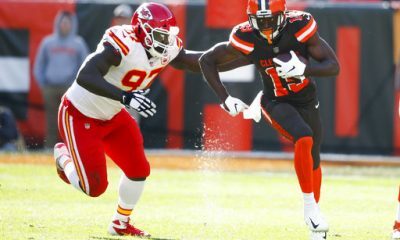 Hunt carried 17 times for 91 yards, a 5.4 average and two touchdowns and caught a 50-yard screen pass for a touchdown on the Chiefs’ first possession. 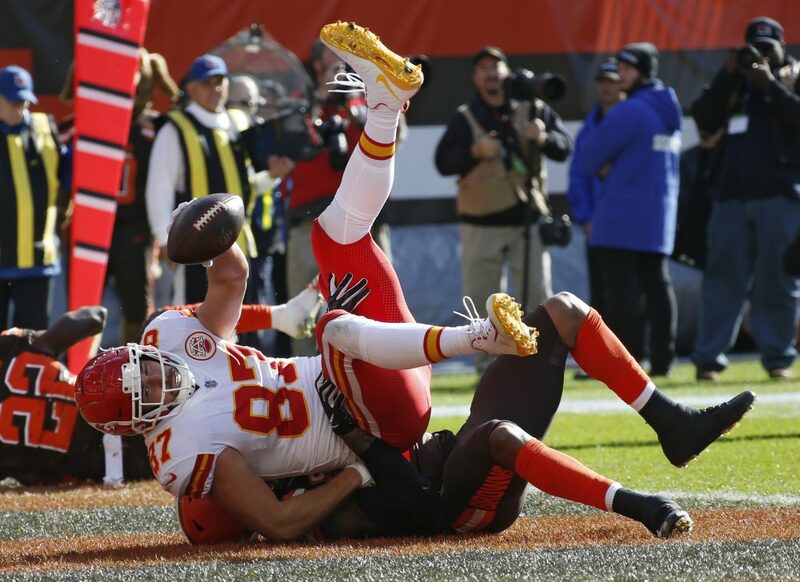 Kelce, a tight end, caught seven passes for 99 yards and two touchdowns, using his 6-foot-5, 260-pound frame to make safety Jabrill Peppers look small on his second touchdown, a 13-yarder. 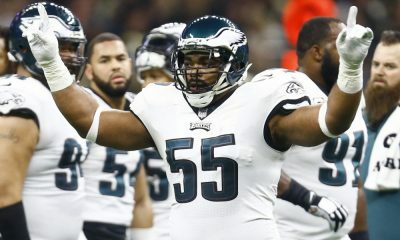 Hunt went to Willoughby South and Kelce Cleveland Heights. 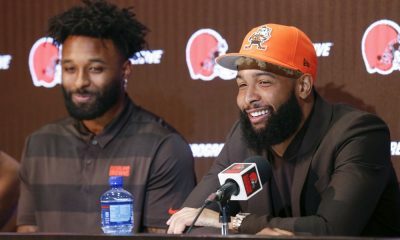 Despite the outcome, the Browns gave themselves a passing grade for handling the turmoil of the week. 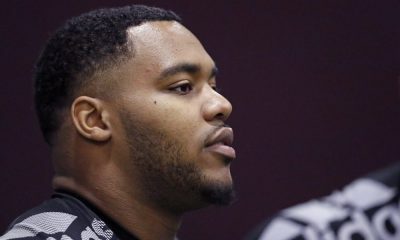 “I never saw any flinch,” Williams said. 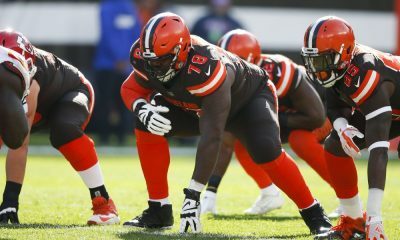 “It felt good to play football again and hopefully get ‘the coach is fired’ behind us and we can progress and win some games,” left guard Joel Bitonio said. 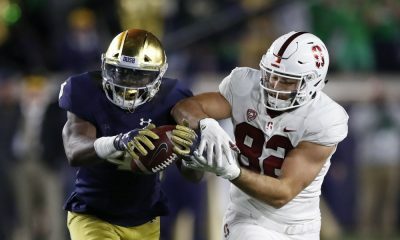 Mayfield dropped to 1-5 as a starter and is in the midst of the first four-game losing streak of his career. He said the losing isn’t beating him down.